Are you obsessed with anything pumpkin but worried that high carb or sugary meals might kick you out of ketosis? If so, then be prepared to find your soon-to-be favorite keto pumpkin recipes here today. It goes without saying that pumpkin is healthy in itself and keto-friendly too. However, the recipes you choose to cook with it will be the deciding factor on whether or not it’s keto approved. Now, without further ado, here are 27 of the best fall recipes. Pick out sweet or savory low carb pumpkin recipes for the upcoming holidays. This tasty cup of keto mocha gives you another reason to love pumpkin spice. It’s the perfect way to start your morning or to enjoy as a delicious mid-morning drink for an extra energy boost. This pumpkin muffin recipe is very light and can be a brilliant snack for the evening. You will fall in love with its perfect texture and taste. Don’t fall for the temptations that will throw you out of ketosis these holidays. We highly recommend Keto In Five. 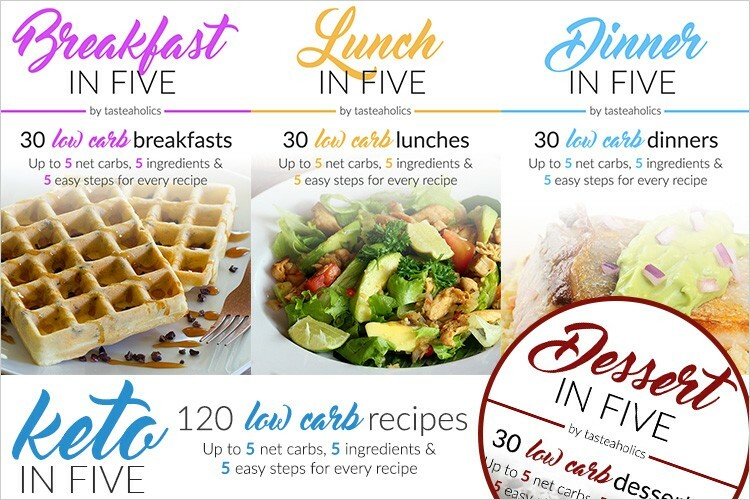 Each recipe requires no more than 5-ingredients! What about freshening up with your mind with a homemade latte on a cold morning? We assure you this creamy and warm cup of coffee will allow you to start the day right. And you won’t have to worry about ruining your keto diet plan. Special discount: Get 15% off with coupon code APERFECT15 and enjoy your delicious keto supplement, free from sugar and nasty additives! The simplicity of this decadent pumpkin pie recipe is so great. It’s as easy as quickly forming the crust, blending the filling ingredients in one hit, and assembling it in no time at all. No bake desserts all the way! Dessert doesn’t have to be sugar and carb-dense for it to be so yummy. This pumpkin dessert is proof of that fact. Gluten-free and sugar-free yet so tasty, this is the perfect layered dessert that will wow your guests – and maybe even win some friends over to the keto cult. Ditch the unhealthy carbs found in your favorite scones by adding these low carb pumpkin scones to your holiday menu. Using a few keto staple ingredients, you will be able to make this treat without experiencing unwanted stress. Isn’t it great that the keto diet allows you to enjoy ice cream guilt-free? As long as you choose low carb sugar-free ice cream recipes of course. With a good dose of pumpkin puree and pumpkin spice, these cookies turn out to be addictive. Lucky they’re not bad for you. Do you love mug cakes? We don’t blame you! As expected, these low carb pumpkin chai mug cakes take less than 5 minutes to make and turn out wonderful for a quick pumpkin dessert. An indulgent ice cream recipe for the pumpkin spice lover, and a low carb healthy dessert option for kids and adults alike. Almond flour is one of the best keto friendly flour substitutes you can use. Combine that with pumpkin spice and a few other keto staple ingredients, and you have a nice breakfast ready. These pumpkin muffins with a healthy dose of cream cheese swirl make an easy tasty breakfast idea. There is nothing quite like a comforting pumpkin soup when it’s cold out. It’s all in this keto-friendly recipe. For an easy pumpkin bread recipe, look no further than this quick low carb gluten free recipe by Mellissa from I Breathe, I’m Hungry. Don’t forget to tell us what you think in the comment section and feel free to PIN this and save for later. I appreciate you featuring my Paleo Pumpkin Chili with Beef, Peppers, and Olives, but I wish I knew why my photo is so small when it’s much bigger than that on my site. I’m not sure why. I tried using a different image and it still comes out a similar size. I so love pumpkin dishes! I’m going to check these recipes out. Thank you so much for sharing!